After restricting the proliferation of CD4+T cells, Human Immunodeficiency Virus (HIV), infection persists at a very fast rate causing Acquired Immunodeficiency Syndrome (AIDS). This demands the vigorous need of suitable anti-HIV agents, as existing medicines do not provide a complete cure and exhibit drawbacks like toxicities, drug resistance, side-effects, etc. Even the introduction of Highly Active Antiretroviral Therapy (HAART) failed to combat HIV/AIDS completely. The major breakthrough in anti-HIV discovery was marked with the discovery of raltegravir in 2007, the first integrase (IN) inhibitor. Thereafter, the discovery of elvitegravir, a quinolone derivative emerged as the potent HIV-IN inhibitor. Though many more classes of different drugs that act as anti-HIV have been identified, some of which are under clinical trials, but the recent serious focus is still laid on quinoline and its analogues. 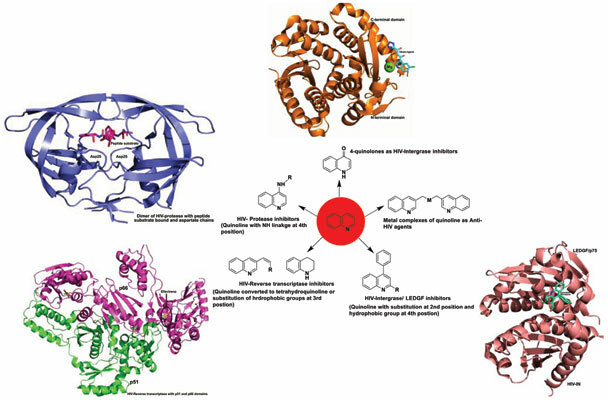 In this review, we have covered all the quinoline-based derivatives that inhibit various targets and are potential anti-HIV agents in various phases of the drug discovery. HIV, AIDS, anti-retroviral agents, quinolines, molecular modelling, HAART.